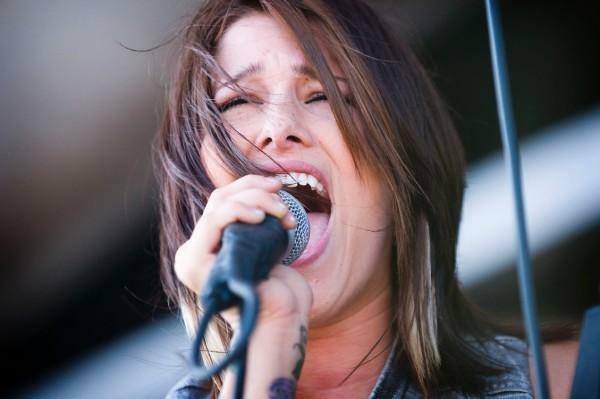 Cassadee Pope of Hey Monday performs at Vans Warped Tour. On the first day of the Vans Warped Tour, Hey Monday meant business and pulled no punches, kicking off with their hit, "How You Love Me Now." Playing all dates on this gruelling 43-city tour, this five-piece band showed no signs they were going to pace themselves for the long haul. Instead they came in full throttle whipping the crowd into a frenzy in this triple-digit So Cal heat wave. In the short amount of time as a band Hey Monday has sold nearly 500,000 songs, graced the cover of several magazines in the United States and overseas, and have received over 28 million plays on MySpace. Hailing from West Palm Beach (Florida), Hey Monday puts new meaning to the phrase "You can sleep when you're dead." Less than two years since their release of their debut album, "Hold on Tight," Hey Monday, fronted by Cassadee Pope has been on the road non-stop for over a year with tour of duties on Bamboozle, The AP Tour, Hot Topic Acousitc Tour, Glamour Kills Tour, Let's Make a Mess Tour and their very own UK Headling Tour. In the midst of all this touring, they've managed to write more songs. Now, news comes that on August 17th , Hey Monday will launch their highly anticipated sophomore effort, "Beneath It All," referencing Pope's brutally honest lyrics. They've already released their first single off that album, 'Wish You Were Here,' and will soon release another as soon as they reach 200,000 Facebook friends (currently, they're at 181,468). So recommend to your friends and friends of friends. Setlist (6/25 - Home Depot Center in Carson): How You Love Me Now, Wish You Were Here (new song), Run Don't Walk, I Don't Wanna Dance (new song), In My Head (Jason Derulo cover) & Homecoming. You can visit their site HERE for Warped Tour video diaries, merchandise, news or stop by just to say hello. Below, Hey Monday sings a new song, "I Don't Wanna Dance," from the first date of Warped Tour in Carson, Californa. Thanks to Noel for the vid below!! Check out more vids from Warped Tour at Noel's site HERE! Here's vid from the Ventura show a couple days later on June 27th. Hey Monday sings "How You Love Me Now."